1-2 An inscription being hand-written onto the mount of a pen & ink drawing, attributing it to J M W Turner. 3 A water gilded plaque being inscribed with the name of a portrait's subject. 4-9 Preparing a back-strut to enable the frame to be free standing. 10-11 Our version of an acorn frame, traditionally used to frame miniature and silhouette portraits. It is lacquered black on gessoed wood with an oil gilded sight edge and an antiqued brass acorn. 12-15 A canvas damaged by fire and water, with brittle flaking paint. It was relined with wax on the reverse to secure it, before the damaged areas were filled with gesso then repainted and varnished. 16-18 Stages in the restoration of a Frank Stella print; before, during and after. Because of broken glass a stain had developed around the artist's signature. 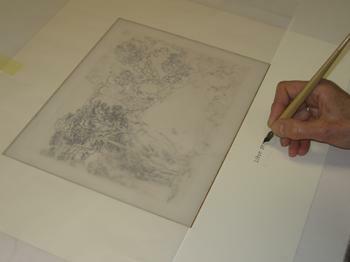 19-20 Applying gelatine size to a wood engraving to give extra strength to the paper. 21-25 Casting carved moulding details to replace missing sections on a picture frame.